The local home stores like Home Depot and Lowe’s often have scrap pieces of 4 x 4 timber. 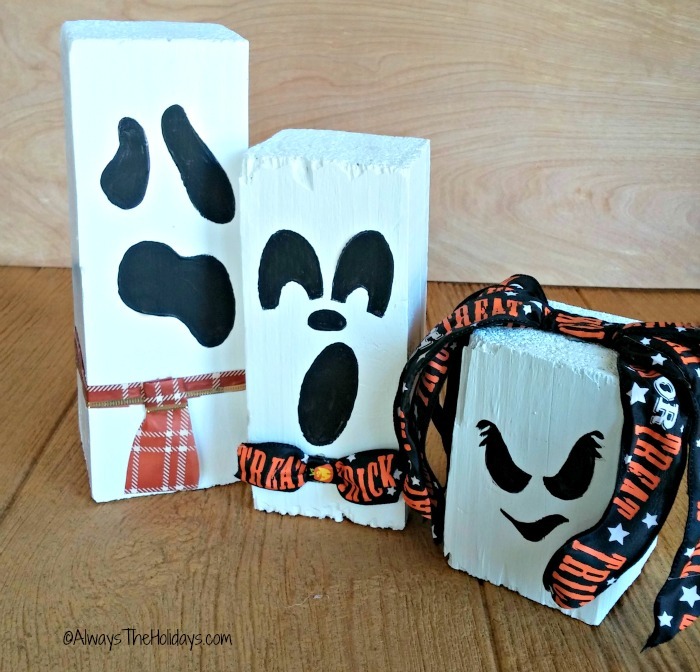 This size is just perfect for making cute decorative pieces like these DIY Halloween scrap wood ghosts. These DIY Halloween Scrap Wood Ghosts are a Fun Project. Always the Holidays is a participant in the Amazon Affiliate Program. This post may contain affiliate links. I earn a small commission, at no extra cost to you if you purchase through an affiliate link. 3 pieces of 4 x 4 scrap wood. I used a 3″, a 5″ and an 8″ piece. 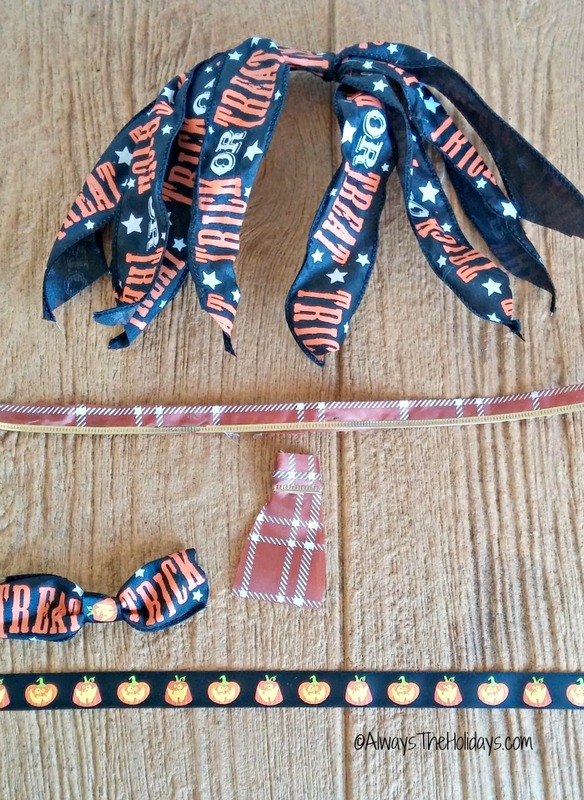 Halloween Ribbon for the hair and neckties. The first step was to do a bit of filling and sanding. Even though I don’t mind imperfections, these pieces of wood had some long splits in them, so I just filled them for a smooth surface on the side I wanted to paint into faces. Now it was time to paint. I used two coats of some left over white paint from my mailbox. It covered well since it had a primer in it. Once it was very dry I outlined the faces on the pieces of wood with a pencil first and then a sharpie. Then I used an artist brush to paint the eyes and mouths on the ghosts. I painted mine free hand just by looking at the printable that I made. 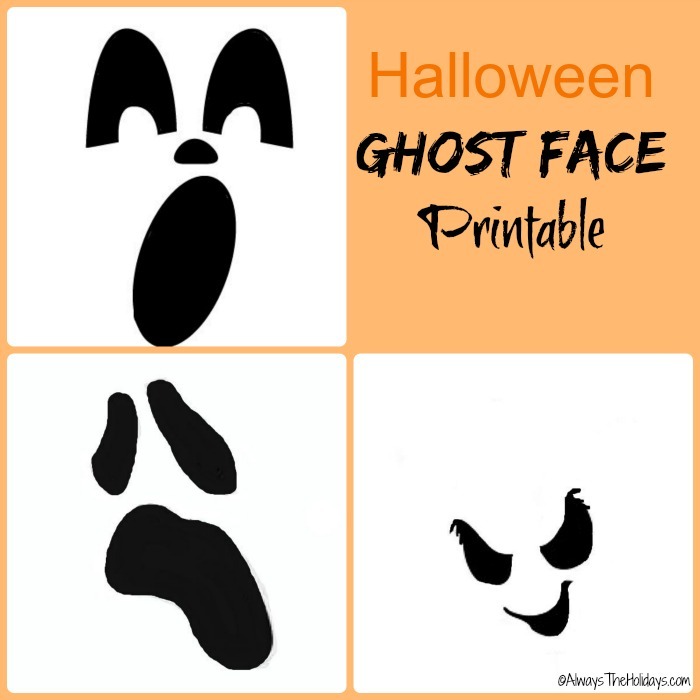 You could also print it out and use transfer paper to get the design on your wood if you are not too handy with a paint brush. Now came the fun part. Originally, I was going to just paint the faces and call it good, but when I got them done, I thought they needed a bit of window dressing. I made the little one have long hair by cutting pieces of Halloween ribbon and attaching it to her head. The two larger ones are her “beaus” and they needed neckties. They were easy to make with the scraps of ribbon that I had left from another project. A bit of hot glue and my guys are all dressed up for the ball! And here they are staged on my steps. 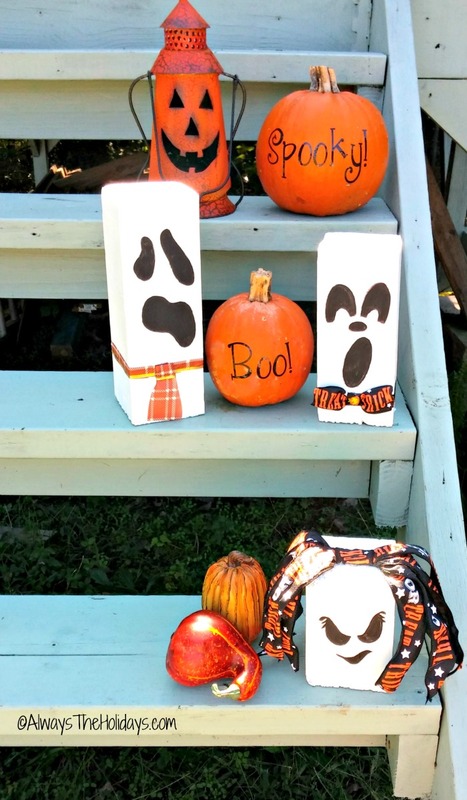 I added a couple of real pumpkins decorated with stencils as well as a cute Halloween lantern and some faux gourds to set the stage. They would be cute made up as snowmen too, for Christmas, wouldn’t they? I think that will be my next project! 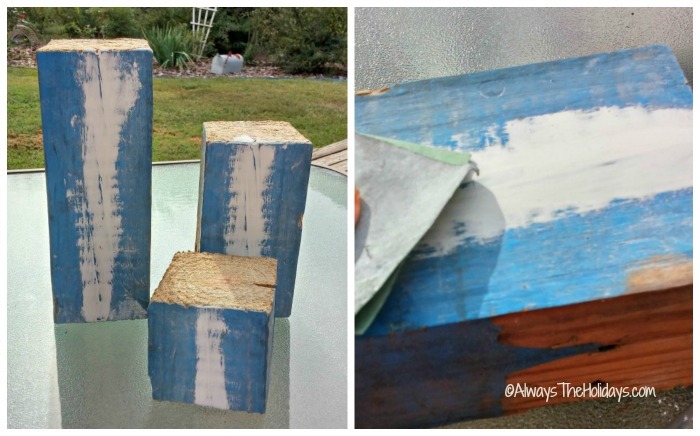 Have you ever used scrap wood in DIY projects? What did you make out of them. I’d love to have you share your projects in the comments below.